Studiometry 10 is a business management application aimed at small businesses and designed to help track and manage projects, create quotes and invoices, and make sure you’re getting paid on time. Geared toward businesses that are anywhere from 1 to 50 employees, the program is designed to grow as your business does, making it easy to convert a standalone database into a server-based business management tool that can handle all your users whether they’re working from a Mac, PC, or iOS device. Creating your initial Studiometry setup is relatively simple. When you start the app you are asked whether you want to setup Studiometry for a single user on a single computer, multiple users on a single computer, setup a server, or connect to an existing server. When creating a new installation you can choose from a small selection of templates, so you don’t have to create your quote, invoice, and report templates from scratch. If you already have existing client, project, and contact data, Studiometry—in principle—attempts to make it easy to import that data. Contact info can be imported from a number of delimited file types or from contacts you already have in the OS X Address Book app, although I found none of the options to be particularly useful or user friendly. In most cases you’ll be better off entering your clients and contacts from scratch. 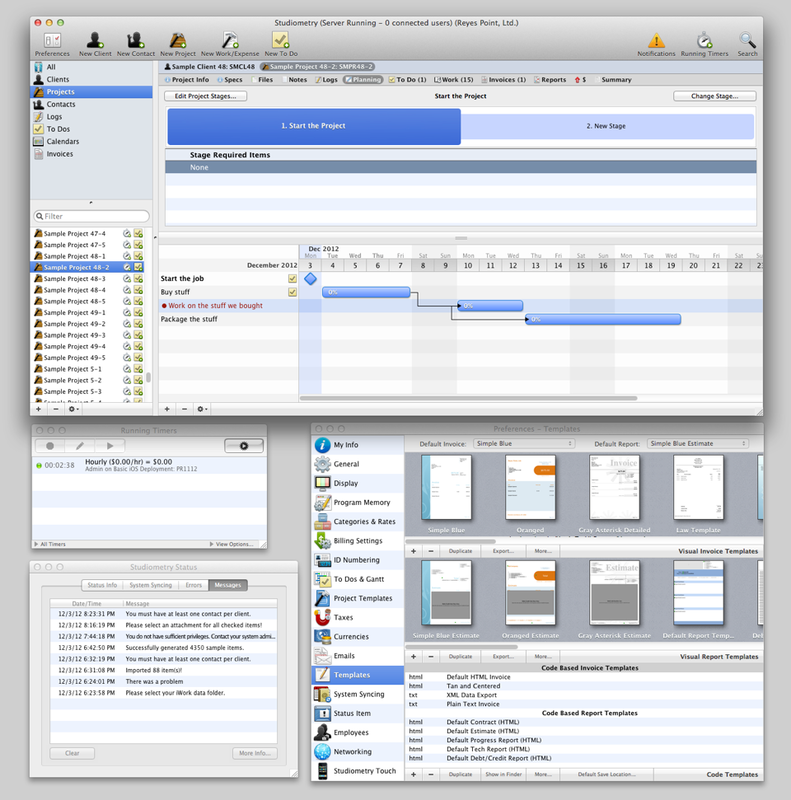 Studiometry offers a full range of features including Gantt charting and time tracking all in a package designed to grow as your business does. For example, the Address Book import tool only displays the first and last names of your contacts but no company name or anything else that might help you differentiate between friends and customers. Also, you can’t search for anything but the contact name, so instead of being able to search for a company and add all those contacts at once, you have search for and add those contacts individually. Once the initial database is created the application opens to a main window containing all of your business information. 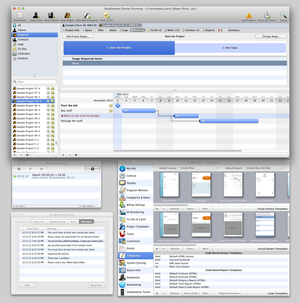 A small list on the left side of the screen breaks your business into several bite-sized chunks: Clients, projects, contacts, to-dos, and calendars, and selecting any one of these items filters the information you see in Studiometry’s main window. In Studiometry everything is related. You create clients and your clients must have a related contact or contacts. You create projects and they must have associated clients and they can have employees assigned to them. When an employee begins working on a project, a timer can be started that collects information on the amount of time spent on that project. Studiometry has built-in Gantt charting that you can use to keep track of every aspect of a project, and if you use Oranged’s Accounted accounting package, anything you do in Studiometry can automatically be synced with your backend accounting system. When you add employees to Studiometry you have the option of limiting the information that those employees see when they are logged in. For example, if you want to keep an employee from making changes to application settings or from viewing specific employee, customer, or vendor data, all you need to do is select that employee and remove their access to data that you don’t want them to see. While the program can be complicated, the basics are pretty straightforward. Creating customers, adding new projects, entering project time, and invoicing are easy. For the basics and beyond, Oranged Software offers a large selection of video tutorials on its website. I found many of them to be useful, although some of the videos referred to older versions of the application. When it comes to customizing estimates, invoices, and reports, Studiometry bears a striking similarity to Marketcircle’s Billings application, right down to the way that some templates look. Like Billings, Studiometry offers a WYSIWYG tool for modifying existing templates or creating templates of your own. Unfortunately, as is the case with every application of this type I’ve ever used, the promised ease of creating your own templates bears very little relationship to the amount of time and effort necessary to create something you’d want to send to a customer. In short, while you can roll your own templates using Studiometry, you’re probably not going to want to. What makes Studiometry a standout is the ease with which you can take the application from a single-user sole proprietorship to a full-on server handling dozens of employees and hundreds of projects with little more than a click. Each connected client requires its own unique license, but those clients can be Macs, PCs, or iOS devices and work the same way the standalone application does. The only thing I didn’t like about the networked version of Studiometry was the licensing for iOS devices. While you can download the app for free from the App store, if you want to sync data from your iOS device to the server you will need to purchase an annual license for $40 per year. Studiometry is an excellent application for managing your business, handling invoices and estimates, and tracking when and whether or not you’ve been paid. Multi-platform capabilities make Studiometry the kind of tool that can grow with your business no matter what direction your business takes and its ability to easily sync with a backend accounting application guarantee that you’ll be able to keep track of where and how you money flows.